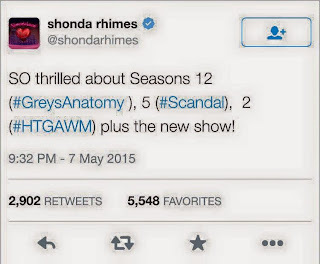 It doesn’t look like Shondaland will be closing up shop anytime soon! 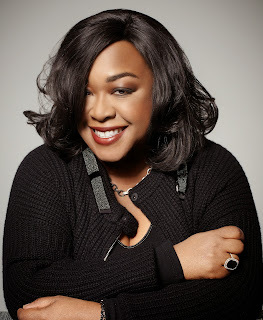 Shonda Rhimes, director, producer, screenwriter extraordinaire has picked up a fourth show with ABC. 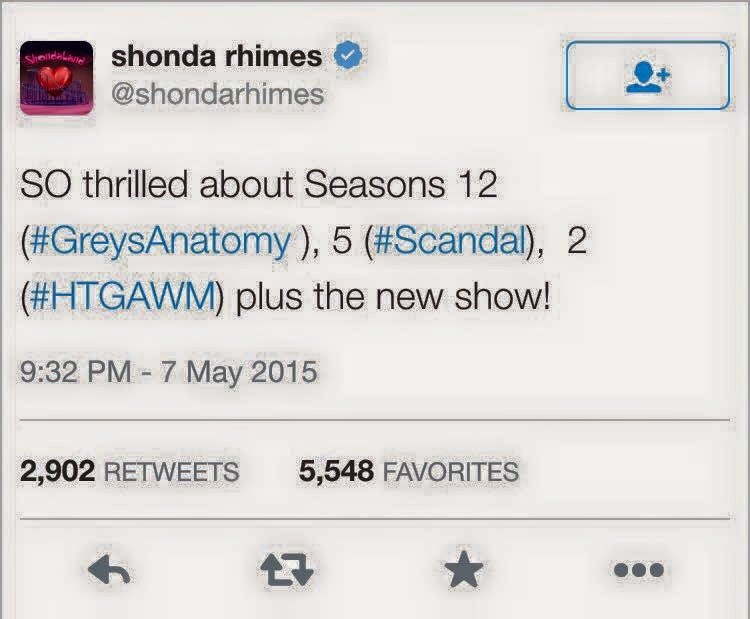 Shonda has taken over our entire Thursday evenings with Grey’s Anatomy, Scandal, and How To Get Away With Murder so she’ll have to find another day to have us on the edge of our seats. Rhimes’ new show, “The Catch” has been described as a thriller where a fraud investigator gets bamboozled by her own fiance. I can feel the heart palpitations already! ..and the nominees are! The anticipation is building for the 57th Grammy’s airing on CBS this Sunday February 8th, 2015 at the Staples Center in Los Angeles, CA. Music artists work hard and perfect their craft for the moment they could one day win a Grammy (maybe even more). A prestigious award that can validate all their hard work and love for music. For the FULL list of Nominees visit http://www.grammy.com/nominees and don’t miss out! Tune in to CBS this Sunday February 8th at 8pm/7c! If Rosie leaves will she be missed? It’s that time for us to embark on a journey of love, lust, champagne once again. In an introduction to Chris’ life, we watch him fish with his father, enjoy a big family dinner, and head down to the local bar. Chris continues on to working out and casually getting in a few squats before he hops on his motorcycle to leave for The Bachelor Mansion. He makes it a point to make it know he’s is not happy about leaving his farm but he’s “ready to find love”. And step one of finding love involves figuring out what Los Angeles has to offer. The Ladies this season are Brit, Whitney, Kelsey, Megan, Ashley, Trina, Reegan, Tara, Amber, Nikki, Amanda, Jillian, Mackenzie, Ashley, Kaitlyn, Samantha, Michelle, Becca, Tandra, Alissa, Jordan, Nicole, Brittany, Carly, Tracy, Bo, Kimberly, Cara, and Jade. This season of The Bachelor starts off very romantic and promising! The beginnings of the weekly butterflies and hope! Tune in every Monday at 8pm on ABC! As many may know Ryan Knight was featured on many of MTV’s Real Word series and challenges. Knight was a cast member on Real World: New Orleans and also later on MTV’s The Challenge. Knight reportedly died this past Thursday in Kenosha, Wisconsin. He was 29. Knight has had a very open and long past struggle to painkillers during his time on the network show. Knight was found dead on Thursday morning after he was reportedly partying Wednesday night. Friends that were in contact with him that night say he had “taken some pills” but not specific as to what kind they were. An Autopsy was completed after he was found and the official cause of death is still unknown. Some friends believe he may have choked on his own vomit and that may have caused his passing. Officials are waiting on toxicology reports to get further information. This is surprising news due to the fact that less than two weeks ago fellow cast member Diem Brown also died after a long battle with Cancer at the age of 34. The glamorous diamond studded ladies of the Real Housewives of Beverly are back! The season 5 premiered of the Real Housewives of Beverly Hills aired this past Tuesday night on Bravo. This season’s premiere was filled with everything we would expect from the ladies of 90210. The cast remains the same with the exception of the addition of LISA RINNA! Last season of the housewives ended with all cast members being at odds. One of the most damaged relationship being ex best friends Lisa Vanderpump and Brandi Granville, this season does not begin any different. Lisa Vanderpump and Kyle Richard’s decide to mend fences and leave everything from past seasons in the past. In this premiere we are also graced by the presence of “ghosts of seasons past” as Bravo refers to them; Camille Taylor, and Adrienne Maloof. This season begins exactly where it left off, with a slew of lavish vacations, classy dinner parties that end in drama and broken alliances, The ladies of ROHBV are back with a Bang and we cannot wait to see more. Gear up gladiators! After a very long wait, our favorite Washington DC fixer is back! Olivia Pope & Associates, Fitz, Mellie and Cyrus will be rejoining for season four Sept 25th at 9/8 central on ABC! In light of the new adventure we are about to go on, let’s recap what happened last season. When Olivia Pope left us, she was on a plane going to an undisclosed location with Jake who is the President’s army buddy and friend and who is also part of B613 a government sanctioned group of professional killers. Cyrus’s husband James is dead. Huck and Quinn were a couple but Huck broke things off with her and appeared at this first wife’s doorstep. Mellie consoles Fitz for winning another 4 years at the cost of the life of their child. David Rosen receives a package from Jake with the instructions “Go get the bad guys.” Maya Pope, Olivia’s mom is in the B613 hole annd finally, Olivia’s father is now back as the head of B613. With a storyline like this we don’t stand a chance. Clear your schedule for every Thursday night for the next months, it’s time for SCANDAL! Orange is the New Black Writer Lauren Morelli has taken her work home, literally, as she has just divorced her husband of two years and is now dating Samira Wiley who plays the character of Poussey on the show. Morelli claims she discovered her new found sexuality while writing scenes for Alex and Piper. “I realized I was gay in fall 2012, one of my first days on the set,” said Morelli in an essay for Mic. “I found myself answering to an endless stream of cast members who peppered me with questions like a gaggle of kindergartners curious about their new teacher. ‘Are you dating anyone?’ ‘You’re married?’ ‘To a man?’ ‘But you used to kiss girls?’ ‘Do you miss it?’ I was finally forced to consider a question that had never, ever occurred to me before: Holy sh-t, am I gay?” The couple has been said to have split amicably after two years of marriage. After months of 5 second teasers with super creepy clowns, caged creatures and fallen angels, the highly anticipated new season of American Horror Story Freakshow has finally released their first official trailer! The new season will have some returning AHS veterans with Jessica Lange, a German expat managing one of the last remaining freakshows, Sarah Paulson as Dot and Bette Tatler a two headed woman, Kathy Bates is the bearded lady, Effil Darling, with Evan Peters as her son, Jimmy Darling. Emma Robberts will also be returning as Maggie, Angela Bessett as the three breasted Desiree Dupree and Michael Chiklis will be introduced as the strong man Wendell Del Toredo. In addition to Chiklis, other newcomers include Wes Bentley, John Carrol Lynch, Finn Witrock, and Jyoti Amge as the world’s smallest woman. Patti LaBelle and Matt Bomer are also scheduled to make an appearance. Ryan Murphy will be taking the reins, directing the pilot for the season. American Horror Story Freakshow is set to air October 8, on FX. David Muir will be joining Brian Williams and Scott Pelley, both over 10 years his senior, as the new ABC “World News” Anchor. Muir has made his rounds with the World News audience as Sawyers chief sub, and since the beginning of this year, has anchored half as many weeknights as Sawyer, 46:92. Since a young age, Muir has known this was the path he wanted to be on. At a mere 12 years old he wrote to Syracuse anchorman Ron Curtis for advice on how to break into the business and impressed him so much, he got his first internship at WTCH-TV the next summer. He went on to work at WTVH for five years before making the leap to ABC News in 2003. Although he will be a main anchor, Muir hopes to be able to report from the field. “A huge part of this for me was a promise that I was not going to be tethered to the anchor desk,” Muir said. He officially replaces Sawyer Monday night.